Who says the NHL has the monopoly on questionable calls and controversial outcomes? 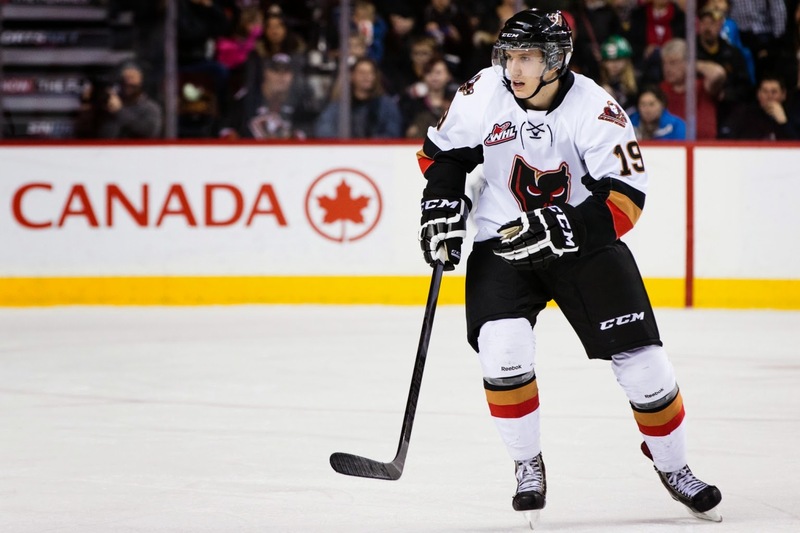 The Calgary Hitmen would tell you that they have some bones to pick with the WHL after a very controversial call wound up being the difference in game 5 of their playoff series with the Kootenay Ice. Neither team has played all that well in this series with both teams winning on the other's ice making home ice more of a curse than an advantage. 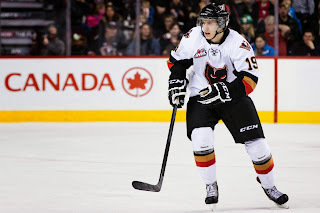 Adam Tambellini (NYR 2013 3rd) and his Calgary Hitmen were looking to take control back in this playoff series but that was not to be as the Kootenay Ice would win a very disputed 6-5 game. Mackenzie Skapski (NYR 2013 6th) found himself on the bench having played poorly so far in this series leaving Kootenay's fate in the hands of rookie goalie Wyatt Hoflin. At the start it did not look like it was a smart move as Adam Tambellini would get his Hitmen on the board with a power play goal just 2:04 into the game and on Calgary's first shot of the game. Kootenay would answer back with a power play goal of their own at 5:56 to tie up the game. Kootenay would then take the lead on an even strength goal at 19:15 taking a 2-1 lead into the first intermission. 55 seconds into the second period Kootenay would make it 3-1 with another even strength goal but Calgary would cut the lead to just 1 goal with an even strength goal at 2:44. Kootenay would then make it a 4-2 lead with a goal at 5:18 as they chased Calgary's starting goalie Chris Driedger who had given up 4 goals on 14 shots. Driedger's replacement Mack Shields was not much help as he gave up a goal at 6:23 to make it 5-2 Kootenay. Calgary would get a goal back with a power play goal at 18:28 and it looked like Calgary was turning the tide. Then the "fun" happened as Kootenay depending on who you support either scored a good goal with 0.1 of a second left in the second period or if you are Calgary it was a phantom goal with the replay officials using a clock that was not in sync with the game clock. To be honest my problem was more that there wasn't a clear ruling by the official Matt Kirk before they went to the replay. CALGARY, AB - The Western Hockey League's Hockey Operations department issued the following statement regarding the goal awarded to the Kootenay Ice at the end of the second period during their game against the Calgary Hitmen. "The video evidence in the Video Goal Judge booth clearly showed the puck had crossed the line with 0.1 seconds remaining on the clock. The Video Goal Judge booth is considered the official time clock when reviewing goals and is the same system utilized by the NHL." Calgary coach Mike Williamson in the post game was quoted as saying ""Apparently, there's two clocks," Williamson said. "They are very close but not completely in sync. "The one they showed on the replay was a tenth of a second ahead I guess." Calgary then should blame themselves for not making sure their own clocks were not in sync. In any event, that goal just about sucked the life from the crowd and for a long while the Hitmen themselves. The Hitmen would score to make it 6-4 at the 12:50 mark and then Tambellini would score his 2nd goal of the game at 18:46 to make it a one goal game but that was as close as it would get for Calgary. Kootenay gets to head back home with a 3-2 lead in the series and waiting for them back in Kootenay for Saturday night will be Tim Bozon who is going to be released from a Saskatoon hospital on Friday. Bozon who contracted Meningitis and at once point was placed in a medically induced coma has recovered and will be dropping the opening puck for Game 6. It will be some game on Saturday night. In Saginaw Adam Pelech (NYI 2012 3rd) and Troy Donnay (NYR 2013 UFA) along with their Erie Otter teammates are advancing to the second round of the OHL's Western Conference playoffs. The Otters eliminated Jesse Graham (NYI 2012 6th) and the Saginaw Spirit in 5 games after a 3-2 overtime win. Neither Pelech or Donnay scored for the Otters as they were +1 and -1 respectively. For the Spirit, Jesse Graham had a secondary assist on Saginaw's 1st goal of the game for his 3rd assist and point of the series. Graham ends his season 11-43-54 and I think the glut of defensemen that the Islanders have will hurt his chances at earning a contract. Someone will invite him to their prospect camp this summer so his professional dreams are not over yet. The Otters now have to wait to find out who they play in the second round as unless the OHL reseeds for the 2nd round then Erie will not have home ice advantage unless upsets happen. Defenseman Ryan Graves (NYR 2013 4th) and his Val-d'Or Foreurs are advancing to the QMJHL's second round after sweeping the Acadie-Bathurst Titans out with an 8-2 win. Graves was scoreless on 2 shots with an "even" and 2 hits while somehow losing a faceoff. I would have liked to have seen how that happened. The Foreurs will have home ice in the second round as the 3rd seed in the field of 8 teams.